“I had such a hard time,” says Mr. Marasek, production property master for Emanuel Azenberg, the Broadway show’s producer. “They didn’t want pits, they didn’t want them coated; the ones from Balducci’s and Zabar’s were too big to mouth. I finally ended up in a health-food restaurant. I’m always looking for dates,” he says with a sigh. Like many theatrical property people, Mr. Marasek finds that his role often resembles a cross between a maitre d’s and a magician’s. Years ago, he says, scripts frequently called for actors to be smoking; now they always seem to be eating. 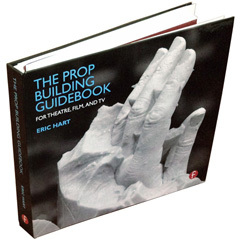 And edible props are seldom to property masters’ liking. They first have to please the actors, who may have food allergies or dietary restrictions. “When Carol Channing was starring in ‘Hello, Dolly!’ her doctors came backstage to ask what she was eating,” remembers Mr. Marasek. “In one scene, she gobbled down dumplings, which were made of spun sugar so she could eat them easily. It turned out we were giving her about a cup of sugar per performance.” When her physicians demanded an immediate change, Mr. Marasek worked with property man Leo Herbert to produce dumplings made of thin paper sprayed with tea and shaped over small light bulbs to dry. At each performance, Miss Channing would “eat” the dumplings and dispose of them discreetly when she wiped her mouth. “‘Biloxi Blues’ has the big mess-hall scene, where the kid hates the food,” he says of the Neil Simon play, which is now on a national tour. “When Matthew Broderick starred, he wanted to almost retch when he saw it.” The concoction was an unappetizing combination of apple butter and green food coloring. Property masters also worry about safety. Mr. Marasek has been known to sew a loaf of bread together to prevent the cast from tripping over a fallen slice. Eating itself poses a risk to actors, who may swallow more than their lines. “A dry cookie can be a disaster,” he says. During tryouts of “Broadway Bound,” for example, actor John Randolph caught a seed in his throat from a piece of rye bread. From then on, only seedless loaves were purchased. Another danger is backstage cooking, which increases the risk of a fire, not to mention the horrifying possibility of a cast felled by food poisoning, or a theater overrun with living things that haven’t bought tickets. That’s why prop men like to keep edibles to a minimum, and preserve purely decorative foods with shellac. Real food is also expensive. Since the 1985 Broadway opening of Herb Gardner’s “I’m Not Rappaport,” Mr. Herbert’s staff has bought approximately 84 heads of lettuce, 84 loaves of bread, 63 pounds of tunafish salad, 42 sticks of butter and 28 jars of mayonnaise just to make one sandwich for each performance. “Those in the front row have to see that it’s tuna,” says Mr. Herbert. But neither of the actors who has had to taste it has liked tuna, which is why the hidden half of the sandwich is purposely made only with butter. Such grocery costs mount, and although sponsors sometimes ease them by providing coupons or free goods in exchange for a program credit, the arrangement doesn’t always suffice. To fill a production’s gastronomical needs, property masters have gone everywhere from Oriental food shops to caterers. Mr. Marasek once even consulted the Catholic Church to find out what the Host was made of, to see if it would be a viable substitute for the “Hello, Dolly!” dumplings. It wasn’t. With so much time, energy and money at stake, property masters prefer artificial food. Mr. Marasek once made a turkey out of plastic-treated felt and cucumber slices out of silicon caulking compound. Liquor is almost never real, as some thieves discovered when they broke into Broadway’s Ethel Barrymore Theatre, where Andrew Bergman’s “Social Security” is playing. What they thought was high-quality Scotch proved to be caramel-colored water. But although artifice plays a major role in property design, theater professionals strive to make their fake edibles look real. Mr. Marasek usually injects the plastic oranges in “Broadway Bound” with water to give them the appropriate weight. Sound is important, too: If an actress throws what is supposedly a tray of frozen fish sticks in a processing plant, they can’t sound like styrofoam blocks. This was the problem confronting Mr. Gianfrancesco, who designed the set, complete with styrofoam fish covered with sawdust batter, for the WPA Theatre’s recent production of Israel Horovitz’s “North Shore Fish.” Wood, he reasoned, was too heavy a substitute and a potential danger to the actors. There is, however, one area in which no one seeks authenticity. “Theater: Edible Props”, by Laurel Graeber. Wall Street Journal, March 20, 1987. I actually enjoy watching the Tonys. I wrote this not out of bitterness, just as an annual reminder that the technicians, crew and artisans of theatre make a lot of the “magic” happen. We already receive little recognition in the playbills; to be ignored by this and most other major theatrical award ceremonies is a huge oversight. I sometimes think this helps lead to an atmosphere where directors and producers think magic just “happens” and that theatre tech can accomplish anything. They think it’s perfectly reasonable to request a new prop on Saturday night and have it by Sunday morning. Or to give a paint note before dinner break and have it be done and dry by the time they are back on stage. Or my favorite, that any item imaginable can be found in the “prop room” that you have hidden away. Of course, many of the recipients of Tony Awards take the time to thank the crew and technicians, knowing that their hard work helped contribute to the success of the production. Some even take the time to thank individuals. Last night, Andrea Martin thanked the rigger for Pippin in her Tony acceptance speech. In 2011, Sutton Foster broke into tears while thanking her dresser. That’s not bad when you consider they only have 75 seconds to thank everyone in their life. The Tonys used to honor technicians and craftspeople. The Tony Award for Best Stage Technician began in 1948 at the second Tony Awards ceremony, and ended in 1963, being received by 14 individuals. Joe Lynn won in 1949, making him the only props person to win a Tony. Peter Feller won the the Tony Award for Best Stage Technician for Call Me Madam. In 1984, he won a Special Tony Award in recognition of his “theater stagecraft and magic” for over 40 years. Other stage technicians have also been recognized through special Tony Awards. Some include P.A. MacDonald (set construction) in 1947, Edward Kook (lighting) in 1952, Thomas H. Fitzgerald (lighting) in 1976, and Walter F. Diehl (president of IATSE) in 1979. The Tony Honors for Excellence in Theatre have also been used to recognize technicians. IATSE won the award in 1993. In 2003, it was given to wig and hair stylist Paul Huntley. In 2007, wardrobe supervisor Alyce Gilbert and CEO of Hudson Scenic Studios Neil Mazzella both won. Last night, one was awarded to Peter Lawrence, the Production Stage Manager on Annie, and over 20 previous Broadway productions. The following article was first published in The San Francisco Call, August 28, 1910, page 14. It is excerpted from a larger article called “The Carpentry of the Musical Show”, by Garnet Warren, and describes the process a Broadway show travels from inception to opening night. The gentleman of theatrical properties has also had pressed into his hands that universal scenario, with rough sketches of furniture by the scenic artist. The stage managers have been conferring, too, with the busy author as to the lists of properties required. Rough instructions are all that are sufficient for most of these. So away goes the propertyman to his workshop among the dust and cobwebs. It is large and has rough, red bricked walls. Fifteen to eighteen men work here in the busy summer season—fellows in blue shirts and overalls and the clothing of toil. The floors are bare and loaded up with dust, shavings, paint, unfinished carpentry, finished chairs and statues. The practical propertyman would seem able to construct most things. He makes machines for wind effects; he paints the odds and ends of scenery; he builds furniture and electric light fixings and makes rugs and carpets and door knobs and even paper mache statues from his own designs. In the six busy weeks before a production begins, too, his work is of a feverish description. About 3,000 separate pieces are sometimes required. The busy bee would appear to come a disastrous second to the propertyman. The First Rehearsal of Principals. Photo by Byron. 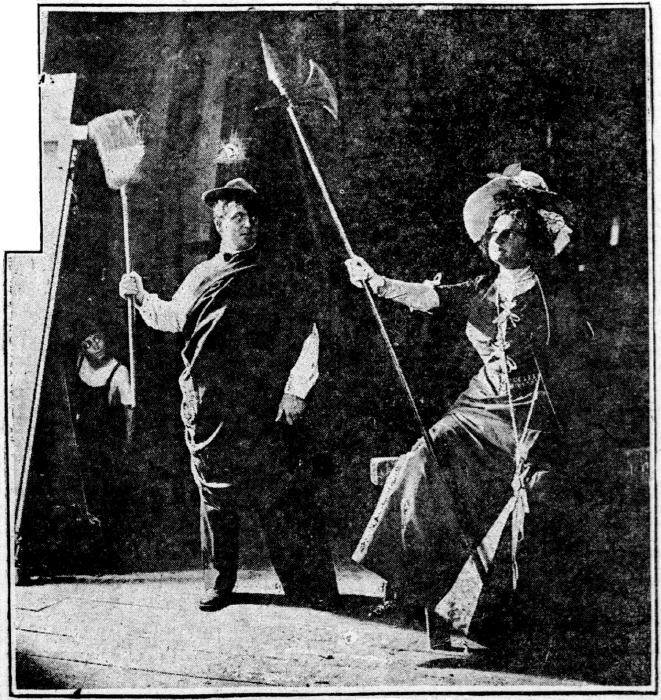 Editor’s note: Notice how the photograph above shows the use of rehearsal props and costumes. Excerpted from “The Carpentry of the Musical Show”, by Garnet Warren, first published in The San Francisco Call, August 28, 1910, page 14.